The girls' Elegance class ring is made of SilverXT and features an oval 8mm x 6mm stone. Handcrafted in the USA by Gold Lance. 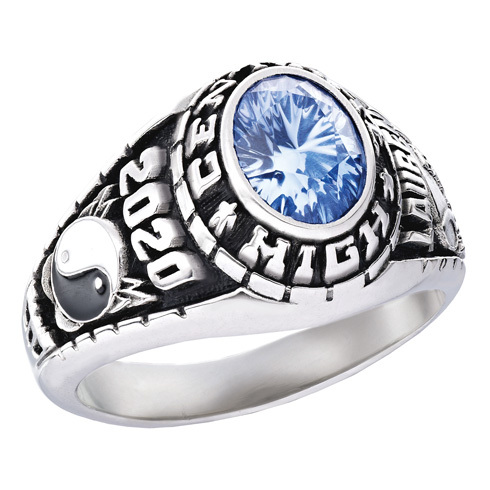 Customize this class ring with your choice of side emblems and engravings. Select activity, school mascot, name and graduation year. Got it according to deliver dates, and Iam happy with my Class ring, wanted to replace my original yellow gold class ring that was to big to wear, and now I prefer silver, Gold looks like to much to display,I was scared to order on line, but you prove is possible. Thanks ! Brought this as my daughters class ring/Christmas present. The ring is beautiful. She LOVES it! About a month after placing my order I realized I ordered the wrong size. I called Joy Jewelers and was able to order the right size being that the ring was still in production. I purchased a class ring and it is very nice but the stone is darker than it looked on the website.